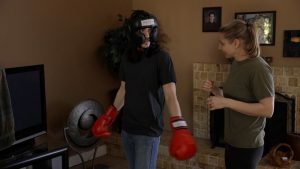 Alexander D’Lerma is winning raves for his new movie, titled “Fear, Love, and Agoraphobia” which was released in April of 2018. The award-winning movie tells the story of an agoraphobic man and a female marine struggling to overcome paralyzing circumstances. Alexander recently discussed the film and more via an exclusive interview. Alexander D’Lerma (AD): Years ago, I was an actor desperate to book my first leading role in a feature film. I was booking small acting jobs here and there but the big movie break was not coming fast enough for me. I had made some very good money as a radio D.J. in L.A. as well as in commercials. I was shooting basket-ball one day with a friend. I told him I was going to write, produce, and star in a feature film that would be shot on 16 mm film. He liked my idea and offered to give me half of the modest budget in exchange for being the second lead actor in the film and writing and producing the film with me. One of my other close friends was supposed to be the director and editor. He wound up being overwhelmed by the whole process and by default I wound up becoming the director and editor of that first feature. It was a dream come true. I did not have formal training as a director yet but I was able to pull it off because of my training and experience in the theater as well as radio where I was not only a D.J. but also a program director and production director. I had hundreds of hours of experience writing and editing commercials and weekend radio plays. Ultimately that first feature did not give me the acting break I had hoped for but I fell in love with writing, directing, producing, and editing for the cinema. I transitioning into filmmaking as well as teaching acting and directing soon after that film was completed. MM: So, I guess that was the big break, so to speak? AD: Although I went on to get formal training the most important lessons were learned on that first feature. I found my true passion which was behind the camera not in front of it. I think those of us who discover our true passion in life and discover what we’re really good at are lucky. MM: How did you hatch the script for this one? Where did the interest in Agoraphobia come from? AD: I had a tiny budget but I wanted to make a character driven film that was entertaining and would have something to say. In the past I have experienced intense feelings of loneliness and isolation. How could I explore it in a broader and more compelling way for film? Agoraphobia is a very interesting anxiety disorder and is related to what I wanted to explore. Approximately 3.2 million, or about 2.2%, of adults in the US between the ages of 18 and 54, suffer from agoraphobia. And nearly everyone, at some point in their lives, has been lonely and felt trapped in their circumstances. That’s how I decided to write my story. “Fear, Love, and Agoraphobia” would be about an agoraphobic man (someone who fears going outside) and a volatile female Marine who are lonely people trapped in prisons of their own making.? MM: Did you do a lot of research into the subject before putting pen to paper? AD: No, I started writing immediately. Improvisation-ally, which is dumb, but I had to follow my gut and just start writing. I trusted my lead male actor Dustin Coffey to do most of that agoraphobia research for me. He was the one who came to me and asked to do a movie with me. He was attached to the project from the very beginning. It was a tricky script to write because I wanted to mix humor with drama and not make a plot driven “cookie cutter” film. MM: What film or filmmakers would you say inspired your movie? AD: Scorsese and Francis Ford Coppola have been the two greatest influences that have inspired me. Taxi Driver was the film that has always been in my head since I saw it when I was ten years only in a run-down theater with one of my older brothers. “The Conversation” is interesting to me. I like to see daring movies like those and like “Lost in Translation.” There is some similarity between that film and ours. It interests me and excites me when filmmakers take risks by trying something unique like those films.? MM: Can you tell us about the cast? AD: I decided to cast two completely unknown character actors in the leading roles. Dustin Coffey and Linda Burzynski. They were not strangers to me. They were actors that I had trained for years in my L.A. based acting studio, The Cinema Gym. I believed in their talent and decided to give them their first leading role in a feature film. As I said before, it was Dustin who asked to work with me and I immediately said yes. I also cast veteran actor Lori Petty (“A League of Their Own,” “Tank Girl,” “Orange is the New Black,” etc.) in a strong supporting role because I was a fan of her work in the 1990s. In the end all the casting choices paid off. F.L.A. has won twenty awards and most of them were “best actor” awards given to the two unknown character actors, Dustin Coffey and Linda Burzynski. Lori Petty also won a ‘Best supporting actress’ award at the 2017 HRIFF. AD: I hope to still be producing, writing, editing, and directing personal cinema of course. But I also hope to write a book about acting and directing for camera. I’ve been compiling notes, from my classes, for that book for the past 11 years. I’ve taught non-stop for most of that time at UCLA extension and my own Cinema Gym studio in Burbank, California. MM: How does someone get to do what you do for a living? AD: Write, work with actors, work with camera, and edit as much as possible. Study the greats. Kazan, Capra, Lumet, Coppola, Scorsese, Bergman, Soderberg, Fincher, Ford, Chaplin, Houston, Spielberg, Bunuel, Polanski, etc. Don’t do a feature film first. Do smaller things. Do scenes. Do shorts. Do them cheap and with your friends. Film-making is the only art form in which the artist thinks he, or she, will hit a homer on the first project. Many aspiring filmmakers get one or two years of basic training but they don’t put the time into their craft. Most students invest a lot of their (or their parents) money in a feature film right out of the gate before really understanding the process. If you have money laying around then okay. Go for it. But if not take a couple of years to work on your craft. You don’t need to put in 10,000 hours before your first feature but at least put in a few hundred.? To learn more about Alexander D’Lerma, visit his IMDb. Comments for Interview with filmmaker Alexander D’Lerma are now closed.